"O, would some Power the gift to give us, to see ourselves as others see us!" I sometimes do it in town when I'm at a loose end, just wander about aimlessly with my camera, ambling up lanes and into galleries, shops, bars or cafes I'd normally ignore, as you would do if you were abroad. Its funny what you can stumble across. So a few Scottish tourist attraction things were on my list to try to get around to seeing. Finally visiting the pandas at Edinburgh Zoo is one on the list, but the weather hasn't really made walking about a Corstorphine hillside seem particularly appealing. However, the wet weather seemed perfect for the Secret Bunker in Fife, and the children had been asking to go to Edinburgh Castle again as we've ignored it for a couple of years now when we've been over that way (the Camera Obscura is the Edinburgh thing that they never seem to get bored with, oddly enough). As granny lives in Fife we are over there a fair bit, but although we make detours to Kirkcaldy and St Andrews on occasion we have never got around to driving to The Secret Bunker, a few miles in land from Anstruther. It was built in a 40 meter deep hole, using the skills of the local miners (I could tell you how I know that, but someone signed the Official Secrets Act, so I shouldn't). Underneath an innocuous looking farmhouse it was initially a radar station in the post-war years, before being converted to be used as the regional seat of government in the event of a nuclear war. There are two floors of rooms that you can look around, kitted out in all the cutting edge technology of the day,which in fact makes it quite disconcerting, when you see how 'Heath Robinson' the technology looks now, that was being used to monitor nuclear armageddon. 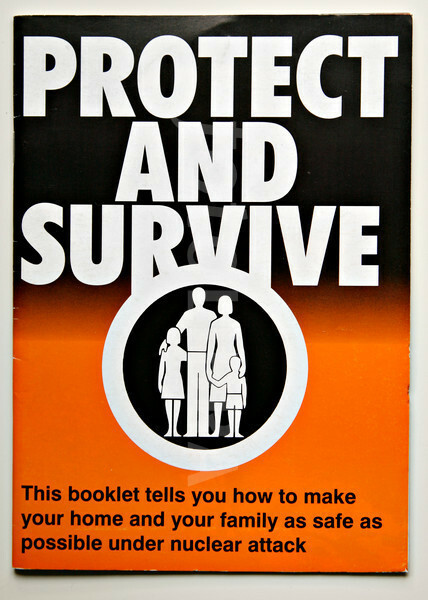 One interesting bit for me was the BBC broadcasting studio, where the "when you hear the air attack warning, you and your family must take cover" broadcasts familiar from Frankie's Two Tribes would come from. It seems bizarre to look back 30 years now and think that we were seriously being told that in the event of Scotland being hit by dozens of intercontinental ballistic nuclear missiles, as long as we made a shelter under the kitchen table and dug holes to crap into, we'd all be fine and that life would get back to normal as soon as the people living in these 2 floors under Fife's fields got things all shipshape for us. 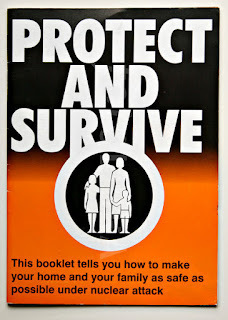 The "Protect and Survive" films which are on show here too just look totally bonkers now (or MAD to use the parlance of the time). Just made me think of the old couple in Raymond Briggs's excellent and sobering book, When The Wind Blows. It was worth coming to see the Secret Bunker although its a bit of a trek unless the history of this time resonates with you. It is difficult to get across to children that when I was their age I was going on marches to Faslane regularly as it really seemed that we were preparing to destroy the world in a nuclear war. It just seems bizarre that we are about to spend billions of pounds replacing these illegal weapons and I was glad to see that CND have been given a wee space in the bunker to highlight their work. We finished off in the cafe, which is also underground and captures perfectly the 1950s level of customer service you expect in a Scottish tourist attraction. A nice touch, if entirely unintentional. Of note on the way there we passed through Lower Largo, on the north side of the Firth of Forth. I had totally forgotten that Daniel Defoe's character Robinson Crusoe was based on a real life character, Alexander Selkirk, born in 1676 in this part of Fife. Today I continued the "let's go to another place's indoor attractions" theme with a jaunt to Edinburgh. Again, with no agenda it was nice to just wander aimlessly with my 3 children, who had specifically requested a visit to the castle. Every time I go to Edinburgh I am reminded what a complete tourist magnet the whole place is, with tourists asking tourists for directions every place you go. I tried to think what I'd make of the castle if I had come a few thousand miles to see it and I have to say I think I'd be pretty disappointed by Edinburgh Castle. It looks great on the photos from down at Princes Street, but there is less to it the closer you get. Historic Scotland don't make you feel that you are walking around a medieval castle - the "Great Hall" is pretty barren, the palace chambers likewise functionally empty. The crown jewels and Stone of Destiny are nice to see, but the buildings feel like the are mainly offices for army regiments. There are more statues and displays of bloody Earl Haig than of any kings and queens, and rooms of regimental history, almost no castle history. There were loads of soggy tourists up there today, mostly looking pretty glum I have to say in the rain. What kind of fool has to buy a poncho though because they came to Scotland in summer without some waterproofs? Dozens of them apparently, that's who. After some lunch we meandered down the Royal Mile as the other place on my kids' agenda was Our Dynamic Earth, a walk which I've done umpteen times, but today stumbled across a couple of museums I've managed to completely blank until now. The Camera Obscura at the top of the Royal Mile is good fun, but we'd done that fairly recently so I was allowed to walk past. The Museum of Childhood is always worth shambling into for a bit of shelter (mainly because it is free) but it is looking a bit rough around the edges, and the stuff in the cases like junk rather than the stuff to bring back happy memories. More interesting further down were 2 that I hadn't been in before, The People's Story Museum in the old Canongate Tolbooth building beside Canongate Kirk, and the Museum of Edinburgh across the road from it. Both are run by the city council and free to get into. The Museum of Edinburgh was a lot of fun as it was completely random stuff in there from Covenanters to Greyfriars Bobby, silversmiths work to chamberpots. My children enjoyed exploring the labyrinthine old building which is much bigger than it looks from outside. My favourite exhibit was a piece of oatcake once belonging to Robert Burns's wife, proudly preserved in a frame, a perfect wee object. We briefly popped into Canongate Kirk, not to see the place Zara Philips was married last year, but to follow the waymarkers to Adam Smith's grave, you know, the Wealth of Nations chap. The odd metal plates laid out through the graveyard to lead you to his grave make for a fine game. Finally on to Our Dynamic Earth, which again it has been years since we've visited. Last time I think they were too young to get it. Under a big tent-like thing at Holyrood Park you are sat through various son et lumiere efforts telling you about the Earth's history. My 5 year old was non-plussed, my 12 year old felt a bit big for "we're all going in a time machine now" ("no we're not, its a lift"). However my 10 year old seems to be the target audience as he absolutely loved it all, especially the big lump of REAL ice they have in one room telling you about the Arctic environment. There are 3D cinema experiences and and a show on the roof of the dome in an annoying American accent telling you about the weather on "Neptoon" and the other planets. All very good and well, but give me a bit of framed oatcake in a dusty glass case over this any day of the week.